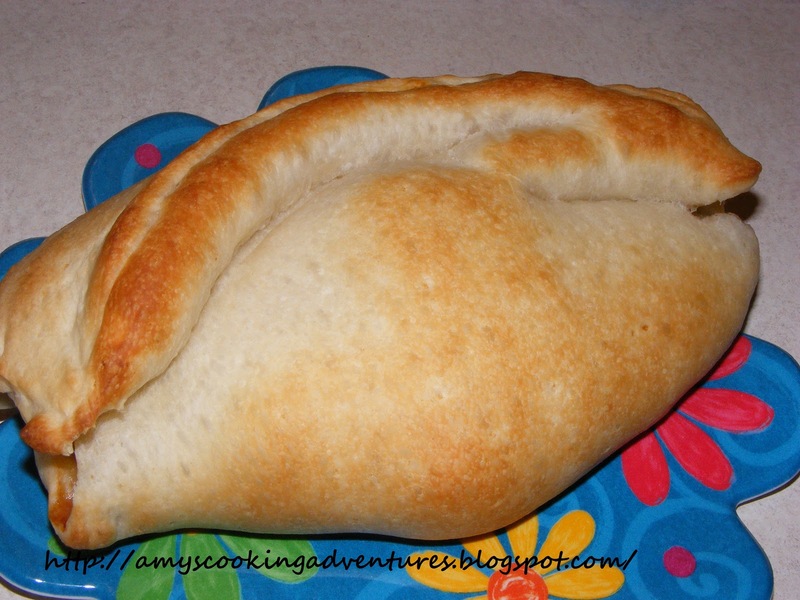 Pizza is always a huge hit in our house and we seem to have it a lot, so every once and a while I like to shake things up a bit using different breads or, in this case, making calzones instead. In browsing the internet, I have found many recipes for calzones and they mostly follow one of two fillings recipes. Filling #1 typically consists of various meats, pizza sauce, and mozzarella. Filling #2 is a nice meatless option with ricotta cheese, mozzarella cheese, and spinach. Both of these recipes seem lacking to me. Whenever I’ve made filling #2, I miss the sauce and filling #1 lacks the yumminess of vegetables (plus there is always the chance that my two year old might accidently eat a veggie this way!) So, I decided to play around combing the two recipes using ingredients that my husband and I both enjoy. I also added in my recipe for pizza sauce, though you could also use your favorite canned or homemade sauce. First, mix all the sauce ingredients together and set aside so the flavors can mellow while you prepare the calzone filling. Preheat oven as indicated on the pizza crust packaging. Heat olive oil in a small skillet. Saute mushrooms and red pepper until tender. Add the spinach, gently sauté about 1 more minute, until spinach wilts. Meanwhile, beat one egg into the ricotta cheese (this loosens it up and keeps it from being clumpy). Stir in mozzarella cheese. Next, open your tubes of pizza dough. I usually just cut the rolled dough in half. Unroll, and you have 4 squares ready to fill. Start by spreading one fourth of the cheese mixture a little off center on each dough square. Follow by spooning one quarter of the sauce on top on the cheese mixture. Last, sprinkle turkey pepperoni and one fourth of the vegetable mixture on top. Fold the dough over to create a pocket. Use a fork to “crimp” the edges so it doesn’t leak. Bake according to pizza crust instructions, starting with the lowest amount of time, until calzones are golden brown.